The New Balance RunIQ is the Android Wear smartwatch we have been made to wait for. The US sports apparel giant announced plans to launch its first Wear-running device in January 2016, which was set to land before the end of the year. It finally arrived in February 2017 and it's pretty much everything we expected it to be, plus a few surprises. The sporty smartwatch packs in GPS plus a heart rate monitor, and sees New Balance team up with Strava to make it easier to track runs and cycling sessions and get the data synced to the popular fitness platform with minimal fuss. In the Android Wear realm that means it's going up against the likes of the Polar M600, Huawei Watch 2 and the LG Watch Sport. Look a little wider and it's also fighting it out with the Apple Watch Series 2 and the Samsung Gear S3 Frontier as well. We had high hopes after the RunIQ made a good first impression during an early-hands on. 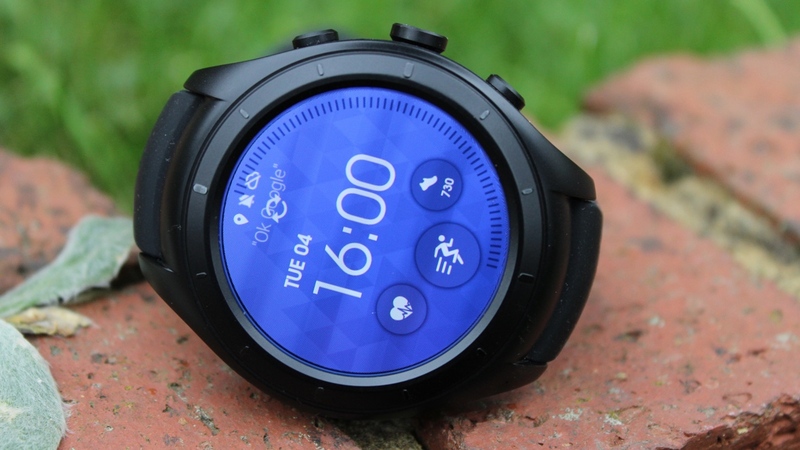 Now we've had the chance to put it to the running test, does it cut it as GPS sports watch replacement? We've been living with it over the last few weeks to find out. New Balance has decided to keep things simple and understated on the looks front and that's absolutely fine with us. The matte black casing, slim bezel and perforated strap don't scream sports watch in the same way that the Huawei Watch 2 or the LG Watch Sport do, which means it can carry off looking like a pretty normal watch when you're not putting the sports tracking to good use. At 14mm thick it's not the most slender of smartwatches, but that's no big surprise when it needs to find room to pack in the GPS, heart rate tech and a battery. It hides that seemingly bulky stature well though, especially in comparison to other sporty Android Wear smartwatches, and doesn't feel like a hulking, big watch to wear. It's actually light and very comfortable as a running watch and everyday smartwatch. The soft, 22mm silicone straps play a big part in making sure it feels nice to wear. The perforated design means it doesn't get too sweaty and means there's more flexibility to help keep it tight and secure around your wrist. The bands can also be swapped out for something more colourful, with New Balance offering a collection of more eye-catching straps. There are three physical buttons to accompany the touchscreen display, all with their own very specific features. The top one launches the Strava-powered tracking app while the bottom one lets you count laps. That's all those buttons can actually do, which feels a bit of a missed opportunity, especially when that bottom button remains largely unused outside of tracking. The middle button doesn't do anything out of the ordinary either, simply turning the display on or off. When Android Wear 2.0 lands, it should be able to launch Google Assistant, so that's one extra thing we know it will be able to do. The buttons all feel a bit stiff and unresponsive, which might be a deliberate move to make sure you don't accidentally launch a tracking session when the watch is not in use. In the display department, New Balance has opted for a 1.39-inch AMOLED touchscreen display with 400 x 400 resolution. So it's comparable with the LG Watch Sport for size, but it's shy of LG's impressive 480 x 480 resolution. It's still bright, vibrant and up there with the best that Wear watches have to offer, though. Good news for water lovers: the RunIQ is waterproof up to 5ATM (50 metres) so you can take it swimming or into the shower. It won't, however, do anything in the way of tracking pool performance. The Run IQ currently runs on Android Wear 1.5, but will be upgradeable to Wear 2.0. We don't know when that's going to happen, although judging by the issues Google is having getting the OS update rolled out on time, it might take a little longer than we expected. That means for now you'll have to live without the ability to download apps from the watch using the onboard Wi-Fi. You also won't get the more customisable watch faces or the improved support when pairing with an iPhone until 2.0 hits. Going back to Wear 1.5 after living with Wear 2.0 feels strange, and not in a good way. Notification support is still reliable and Google Now integration remains a little messy and overbearing. New Balance does include a couple of its own watch faces with complications (widgets) to check in on resting heart rate, step count and launch sports tracking. There are a couple of Google Fit faces as well, but until Wear 2.0 is in place, your ability to add in third-party complications is limited. The Intel Atom Z34XX processor, along with with 512MB of RAM powering performance, should be enough to keep things running smoothly, but it can feel laggy in places, especially when launching the Strava app and swiping through notification cards. The 4GB of storage means you can transfer music over to the watch and pair with Bluetooth headphones to listen to tunes during a workout, sans phone. New Balance also includes its own MyNB app on top of the Android Wear app but there's not much to write home about here. You can tinker with watch settings: tweaking watch face colours, choosing the main metric displayed during tracking, heart rate zones and turning on the audio messages to tell you when you've hit distance markers. There's more marketing material than there are settings so you might find yourself spending very little time in the app. But you do have to download it to get the watch up and running along with the Android Wear app, which can make for a confusing experience. While it's difficult for hardware manufacturers to make Android Wear feel all that different on the software front, New Balance makes a valid attempt by deeply integrating sports tracking app Strava into the RunIQ experience. That means that once your Strava account is set up and connected, hitting that top physical button pushes you into tracking mode. It only supports running or cycling and settings are pretty minimal, letting you do things like activate auto pause and change units of measurement. You can swipe through four different screens showing distance, endurance (based on heart rate bpm readings), cadence and laps. Swipe down on the touchscreen and there's also a really well designed music player widget for skipping tracks and adjusting volume. It currently only works with Android phones, though, with iOS support in the works. When you're done with your workout, data is automatically synced directly to Strava. It's a really simple app to use, data is easy to soak up on the move and syncing does work effortlessly. It is disappointing that there's no support for indoor run or cycling tracking here though. So we've established that the Strava support works pretty seamlessly, but it's no good if the tracking isn't up to scratch. We've focused on the run tracking, but we'll update how it holds up for cycling at a later date. GPS signal pick up is not the quickest, and we've definitely spent a good few minutes staring at the loading GPS message before being able to get up and running. We did find you can get up and running and the mapping does its best to catch up. To test the accuracy we put it up against the TomTom Spark 3 GPS sports watch and we were happy with the results. Pacing and splits were in line, as were elevation recordings. Sadly we can't quite say the same about the heart rate sensor data. The average bpm readings and the time spent in heart rate zones were in line with the Spark 3's sensor and the Polar H10 heart rate chest strap we also ran with. The maximum heart rate data readings, though, appeared wildly inaccurate, with a difference of 10bpm on some occasions in comparison to the other two devices, which we have come to rely on for accurate readings. Sadly it looks like another optical heart rate sensor to add to the long list of ones that simply are not good enough to measure accurately from the wrist when you start factoring in high-intensity training. The RunIQ features a 410mAh battery that should get you a day's use and five hours in GPS mode, meaning it should make it good enough for a slow marathon. Although we're not sure how comfortable we'd be relying on it for a sub-5 hour marathon based on our experiences. In general use you'll get a day max and not much more, but as soon as you factor in GPS and heart rate its stamina takes a bit hit. After a couple of hours running, it was down to the 40% mark, which doesn't leave you too much to play with for the rest of the day or the rest of a race. That's a very similar performance to what we found with the Tag Heuer Connected Modular 45, albeit that's not a fitness-focused smartwatch. During a half marathon race on a separate occasion with the battery not quite at 100%, the screen was black within a couple of miles. Sports watch replacement? We don't think so. As is always the case, tinkering around with display settings and not utilising the sensors can make the difference, but that kind of defeats the purpose, especially with a smartwatch masquerading as a sports watch. The charging cradle clips into the back of the watch and can take a good couple of hours to get back to 100% from a completely flat battery, so it's not a rapid charger either. On paper, the New Balance RunIQ is a sporty Android Wear smartwatch that has it all. An attractive and not-too-chunky design, Strava integration, built-in GPS and heart rate sensor. In reality, it feels like a missed opportunity for New Balance. Granted, elements of the RunIQ impress, such as Strava support, but among other things it's let down by the heart rate sensor and battery performance that would put off any runner or cyclist that takes tracking seriously. The lack of Wear 2.0 is a real disappointment as well. If you’re sold on Android Wear and need those sporty features, go for the Polar M600 instead. It’s a better all-round device, already runs Wear 2.0 and Polar is preparing software updates to improve the already decent battery life and add new sports tracking modes. We’d like to see New Balance have another go because there's the nucleus of a good device here, but right now the RunIQ doesn't quite hit the mark.